A monstrous creature with multiple iterations and origins within DC Comics, Doomsday is a supervillain with Kryptonian roots, often appearing as the ultimate opponent to Superman. His comic book version debuted in 1992, designed by writers as a physical challenge to match the indomitable strength of the Man of Steel himself. Often seen terrorizing the Justice League, Doomsday makes an appearance in the 2016 film Batman v Superman Dawn of Justice. Here at Superheroes Direct, we bring you Doomsday apparel and collectibles sure to please any fan of this beastly supervillain. 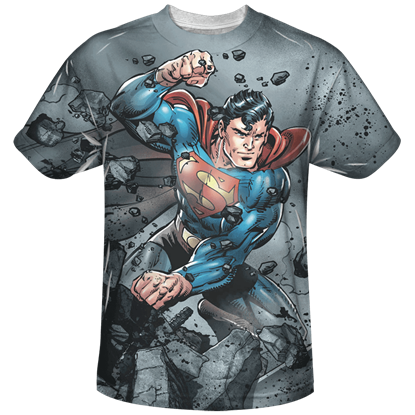 Check out our t-shirts featuring Superman and Doomsday posed in epic battle, with graphics reminiscent of classic comic illustrations. Keep checking back for more additions to our selection of Doomsday merchandise. Its Superman vs Doomsday in the battle of the century. Who will win, the solar powered superhero or the indestructible destroyer? You can display a graphic from this legendary battle with the Final Fight T-Shirt.